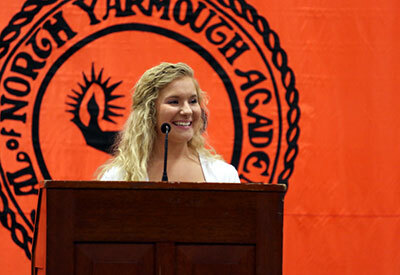 One of the great traditions of the academic program at North Yarmouth Academy is the senior speech. Given the school’s focus on fostering public speaking skills from the elementary through high school years, the senior speech program is a fitting representation of the high level of writing, thinking, and speaking that NYA students have developed during their time here. Though it is a graduation requirement, the senior speech plays a much deeper role in the school, serving as a rite of passage for students and acting as a symbol of the strong community for which NYA is distinguished. Throughout the year, two or three seniors take center stage at our weekly all school meetings to present their speeches, which have been carefully crafted and rehearsed over the course of three and a half weeks (of course, many students start thinking about their speeches long before then!). Seniors are free to speak about any topic that they believe is both important to themselves and meaningful for the entire community to hear. Speeches range from the personal to the philosophical, serious to humorous, providing insight into each student’s personality and interests as well as the ethos of each year’s senior class as a whole. In addition to the entire Upper and Middle school student body and faculty, the audience of each senior speech typically includes staff members, parents, grandparents, friends, family, and even an occasional alumnus. On average, each speech is six or seven minutes in length, though some particularly memorable ones have stretched to near ten minutes.